This is addon for 2d mesh polygon boolean union. I have show what it can do in the image. A must-have tool I’ve ever seen! Thanks for the work! It looks like the famous addon X ALL, but even nicer. A great Thanks for your job so usefull: I’m architect! Yes. This’s a good idea to improving blender That If something selected just processing selected objects(elements). Each selecting tool should be improved like this. Really great addon ! it has some similarity with the “xall” function of the good tinyCAD VTX addon but has the enormous advantage of not removing the faces, working around the failure of the official booleans when it comes to 2D. yep, this stuff should totally be included in the standard distribution, as fast C code – this is why I’m not writing this kind of scripts anymore. 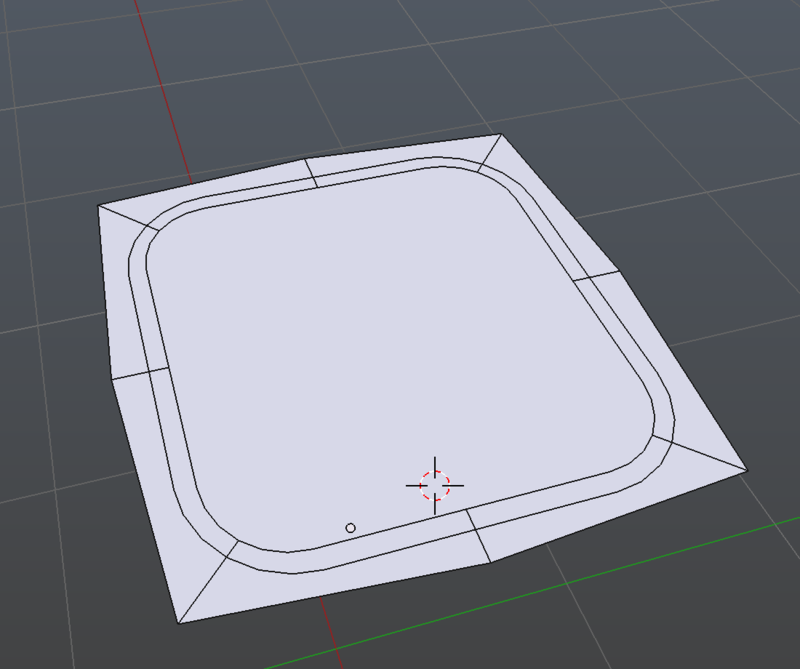 Welldone nixy you will soon make my tinyCAD addon redundant! zeffii, thanks for your encouragement. Yes, mkbreuer, you are right. It can work not only for co-planar faces, and can cut in view direction. 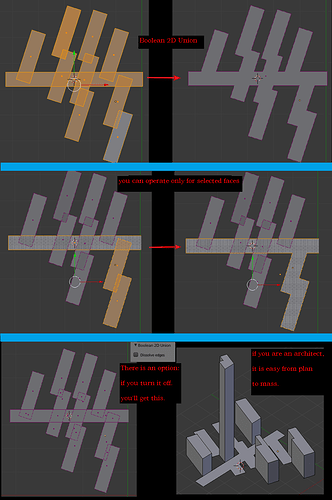 Would it be possible to extend the addon with Boolean 2D Intersection and Boolean 2D Subtraction? Guys, why don’t you just use shapely, the powerful geometry library, for these kind of things? Then we dont need a separate addon whenever somebody tries to solve his own problems. Shapely does union, intersections, offsets. Just use this library and make ONE addon. Then we dont need a separate addon whenever somebody tries to solve his own problems. Some people like solving their problems by creating their own solution. It’s kind of a learning experience. I know I needed a particular feature that wasn’t in Blender, so I just decided to make my own add-on. I totally agree that it is a good learning experience. It just might turn off the potential users of those addons if they have to install miriads of them. Would there be a way to have a crossplatform version of it that doesn’t require to install deps that have to be updated on every new version of Python? I find libraries really good, but in that case, wouldn’t it be faster and less “manual updating” intensive to include the C part directly into Blender. I’m ok with it if you want to maintain that, but most of the time, such niche projects die with the maintainer leaving the project. Below you’ll find the build instructions I packed also into the downloads. I just post it here to minimize chance for it to get lost. It allows you to build libgeos for your platform and relatively link the binaries to each other. Put them in the DLL folder of shapely. Shapely should support Python3.x now. No need to adapt it yourself: https://pypi.python.org/pypi/Shapely. With these instructions it’s not much work to maintain the lib. I can do it. You can help me. (Especially the linux part). Deal? EDIT: I can imagine Blender devs not really want to include a geometry library if it’s not used by a built in operator. They anyway want to keep the size of Blender as small as possible. That means: Only if libgeos should become more important for several parts of Blender they would integrate it. –> this tells libgeos_c.dylib (which can be called from python) where it can find the c++ library “libgeos.3.4.0dev.dylib”. LINUX: replace install_name_tool with chrpath and dylib with so.